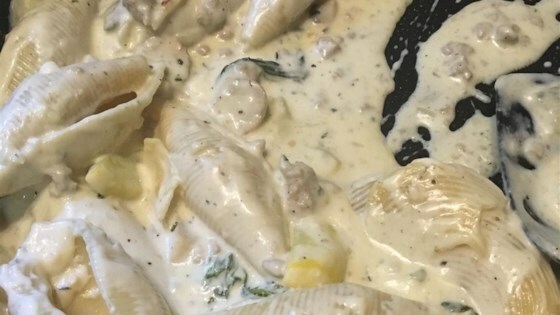 "This alfredo is great just a little lighter than before. Not as rich but still so tasty. Great when served with whole wheat noodles." Melt butter in a non-stick saucepan over medium heat; melt cream cheese and garlic powder in butter, whisking Pour in milk, a little at a time, whisking to smooth out lumps. Stir in Parmesan cheese and pepper until smooth. Remove from heat when sauce reaches a creamy and thick consistency, about 5 minutes. This sauce will thicken rapidly as it cooks - thin with additional milk if cooked for too long. This recipe is a healthier version of Quick and Easy Alfredo Sauce. So simple and so delicious! It was quick, easy and tasty. i really liked this! basic - which is what i like!